Journalism lead faculty Erica Edwards, left, and Chronicle editor-in-chief Aly Rodgrigues make a presentation to the DCCCD Board of Trustees on May 1. Phi Theta Kappa members attend 2018 Catalyst Convention in Kansas City in April. Newborn Canada geese explore their new home by the lake at Richland in April. 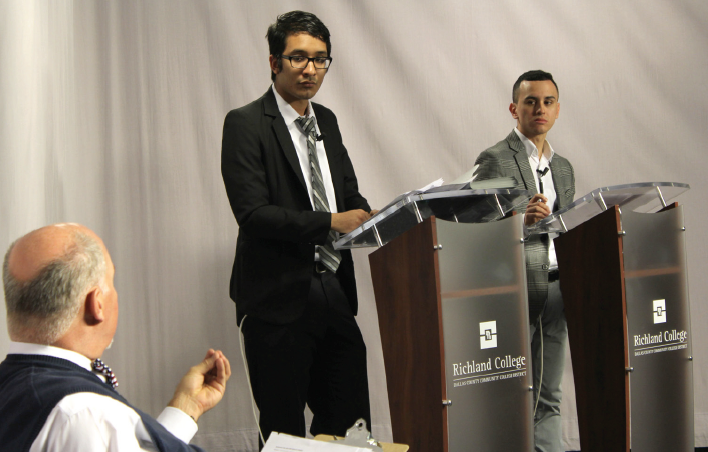 Brian Miranda, center, and Drew Castillo take questions from moderator Patrick Moore during a debate on the future of DACA in The Chronicle TV studio March 7. Maria Toro shares her story about gun violence during the campus Student Walkout on April 3. Pianist In Seub Jung (left) joins vocal professors on stage after their performance on Feb. 6. Richland students Luu Nguyen and Ngoc Nguyen takes a selfie with the Hula Grace Dancers, fire showman Tay Kham and the Thunderducks mascot at the 2018 Intercultural Festival on April 11. A Mardi Gras harlequin entertains in the El Paso Student Lounge on Fat Tuesday Feb. 13.